Our Smartlog health and safety app is for unlimited users at an affordable price per office location. No matter how many users you have on our health and safety app the annual license fee stays the same. We believe in safety, efficiency & affordability. Smartlog is Safesmart’s Health & Safety and Fire Safety Software & Online Training System. For Full details about Smartlog Click Here. • Free Support for System & Health & Safety Queries via Phone & Email. Our Smartlog health and safety app provides offline Smartlog functionality so that Risk Assessments and Checks & Tests can be completed wherever you are, without the need for Internet, 3G or 4G. It works on iPhone, iPod touch & iPad. Once your device is connected to the Internet again, all data you entered into the health and safety app will sync with your online Smartlog account automatically. Dictation on the IOS keyboard even means you can complete text fields via voice to aid efficiency. To use this app you must login with your Smartlog ID, Username and Password. You can view this app on the Apple App Store: here or search for Safesmart Smartlog. A health and safety app needs to present information clearly and be easy to read quickly. Our App has clear app icons and an easy to understand interface. Check & Tests that are assigned to users are presented in order of priority and when filling them in they can automatically assign corrective action to be taken by other individual or groups of Smartlog app users or Smartlog online users. If checks & tests are not completed by users there are levels of escalation so others can be notified via email of who hasn’t taken action. This gives you a clear audit trail and ensures management control and efficiency. You can create your own check & test questions that can appear on the app in the order you want and you can add photos as well as comments. 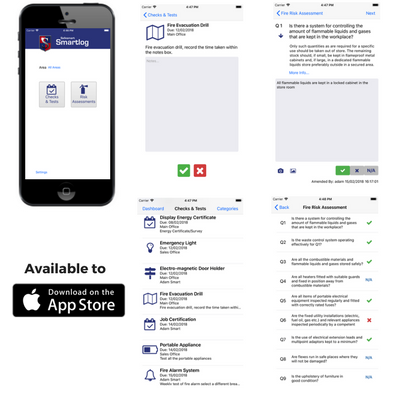 With its Check & Test Functionality, Our Smartlog App is Both a Health and Safety App and a Maintenance App. Maintenance apps needs to be clear and efficient. The simple, speedy and effective menu in our app helps people spend less time with admin and more time on maintenance. Our Smartlog health and safety app can hold templates such as our fire risk assessment template, DSE, COSHH and more. You can also add your own custom interactive risk assessments to the app so that all of the appropriate risk assessments are alerted, actioned and recorded offline to then sync when online. Failing the risk assessment questions also assigns corrective action to be taken by other chosen Smartlog users which makes the risk assessment self-monitoring to help ensure that issues are not missed. With its Risk Assessment Functionality, our Smartlog app is both a Health and Safety App and a Risk Assessment App. Whether you’re looking for a fire risk assessment app or a custom risk assessment app our Smartlog app is the solution. Photo evidence to show and explain issues can be very useful. It is for this reason that our Smartlog health and safety app has the ability to add photos directly from your camera and your phone’s image library. Photo maintenance checking can improve efficiency and makes maintenance apps like Smartlog very useful. The ability for a health and safety app to work offline is key. Our Smartlog app works offline and online and can be downloaded by an unlimited number of users free of charge with your Smartlog annual license subscription. Our Smartlog App is Free to Download and you can have a free trial of the app too. Usage of our Smartlog app is included in your SL5 Smartlog Annual Subscription fee, an affordable fixed cost per office site which includes an unlimited number of user accounts. Book a Free Demo of Smartlog and a Free Trial our Smartlog App. Complete the form below or call us.